70% of persons with disability (PwD) in India live in rural areas. 87% of India has phone connectivity. Namma Vaani in Karnataka and Hamari Vaani in North India was launched to reach this section of society. The focus of the program is on “reaching the unreached”. How will you use this platform? 1. Give a missed call to the mobile number using any of your basic mobile phones. 2. Listen to various information on wage employment, self-employment, solutions, opportunities, etc. 3. Use this platform to publish your local specific requirements. 4. You can use this platform in many other ways all free of cost. Give a missed call NOW. Watch this video and find out how Namma Vaani, an innovative social networking idea, is connecting persons with disability and enablers across Karnataka, changing lives and enabling the community at large. 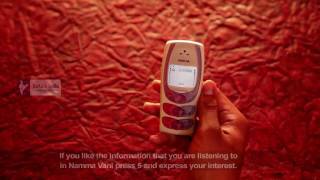 Watch this video and find out how Namma Vani, an innovative social networking idea, is connecting persons with disability and enablers across Karnataka, changing lives and enabling the community at large. Watch this video and learn to navigate, like, comment and share on the Hamari Vaani platform. What is Namma Vaani and Hamari Vaani? This is an interactive voice response system that enables persons with disability (PwD) to share and create content and bring communities together through mobile phones (without internet). Being a collaborative platform, the user can record and share his / her solutions, issues, feelings and hence enable their own livelihood. Parents, NGOs, governments, companies and other volunteers can also share issues related to PwDs and exchange knowledge and experience thus reaching the larger community. Persons with disability - especially in the rural areas, get access to knowledge and training from experts, record and share solutions, issues, feelings and hence enable their own livelihoods. Parents, NGOs, Companies, Volunteers - share their feelings, issues and knowledge and gain from the larger community. Government - can get the needs of the community, get data and analytics which will help them take decisions and dispense schemes which will benefit persons with disability. Universities – can get case study and engage with other like-minded institutions. They can also share about the programs, campaigns, courses and events running in there campus. Namma Vaani was launched in March 2016 and receives 1 call every minute. As of July 2017, Namma Vaani has received more than 2,18,000 calls from 11, 569 unique users. 95% of the content is user generated. Namma Vaani operates in Karnataka. Hamari Vaani was launched in June 2017. As of July 2017, Hamari Vaani has received more than 2,500+ calls from 1,000+ unique callers. Hamari Vaani operates in the Hindi speaking states of India. Write to hamarivaani@enableindia.org for more information on Hamari Vaani. Listen to the journey of a person with low vision who is self-employed in sheep-rearing activities. Rajanna, by overcoming his challenges, has become a role model in his village. Solutions need not be expensive- they just have to be innovative! Listen to this audio of how Ramesh, a person with physical disability, found a simple solution for his work place, after realizing that he could not afford to buy a water bed! This is the inspiring story of Pradeep, a person with intellectual disability, speech impairment, low-vision, and hard of hearing who has found success in his career, with the support of his parents. Pradeep has now received awards for his performance!